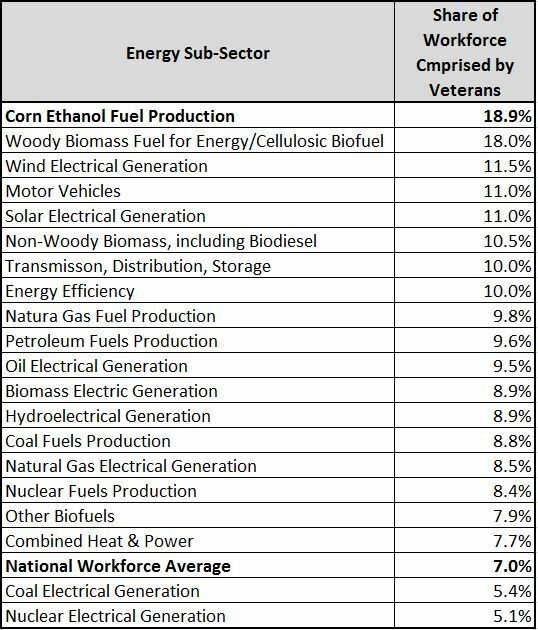 WASHINGTON — A new Department of Energy (DOE) study on employment in the U.S. energy sector shows that America’s ethanol industry employs a significantly larger share of military veterans than any other segment of the energy industry. Nearly one in five ethanol industry employees is a veteran (18.9%), compared to a national average of 7% across all sectors of the workforce, according to the DOE study. Per 100 workers, the ethanol industry employs twice as many veterans as the oil and gas sector and nearly four times as many veterans as the coal and nuclear power generation sectors. Other renewable energy sectors, including advanced biofuels, wind and solar, also employ a relatively large share of military veterans. Across all energy segments, veterans comprise 9% of the U.S. energy sector’s workforce, slightly above the national average. The share of veterans working in various energy sectors is broken down in the table below. The DOE study is available here.